For all intents and purposes, the Angels are having a disappointing season. Not every club that begins the season as a contender is able to end it in the same way, but somehow the organization has been remarkably consistent in their path to disappointment. For the third year in a row, they’ve been swarmed by numerous debilitating ligament injuries to the arms of controllable starting pitchers — seven in the last three years and four this year alone. This season, that list is headlined by Shohei Ohtani and Garrett Richards. Craig Edwards recently discussed the team’s competitive positioning and outlook following the news of Zack Cozart’s season-ending labrum surgery, noting that, at the time of publication, the Angels had just a 4.5% chance of reaching the postseason. Edwards advocated that, with little to sell and hopes of contending in the near future, the club’s best course of action may be to do nothing, to bet on positive regression, and to hope that Seattle falters before the end of the season. With numerous players’ failing to reach their projected levels, one might say underperformance is the team’s middle name. 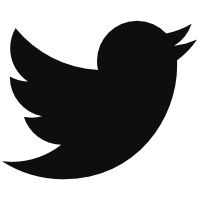 (Well, one of them.) Platoon specialist Luis Valbuena sports a 57 wRC+ against right-handed hitters, fanning a whopping 34% of the time. Ian Kinsler boasts a measly .214 BABIP en route to a batting average just five points higher, and Cozart had a rough albeit inconclusive go in learning the hot corner (-5 DRS in 278.1 innings). Kole Calhoun’s year, however, is the most incomprehensible roller coaster of them all. A perennial three-win contributor that pairs top-line defense with a can-do gritty toughness, Calhoun’s demise came with not just a performance obstacle but a downfall in team morale. Through Thursday, the corner outfielder’s hitting woes were the fourth-worst in the league, and for numerous weeks, Calhoun was in the single-digits, even in negative territory. He has spent most of the season hitting under the Mendoza line and is currently slashing .187/.237/.319. His OPS of .556 is 48 points lower than Max Muncy’s slugging percentage. Take a look at the company among which the Red Baron finds himself. Min 250 ABs each season. As for what’s causing such a stark decline in hitting performance, the following chart appears to go some way towards explaining the phenomenon. 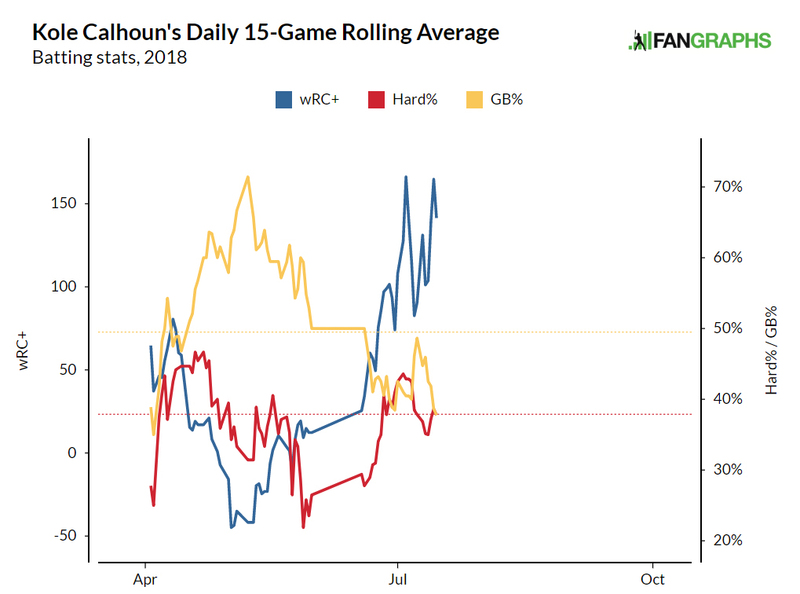 Despite hitting the ball exceptionally hard to begin the year, Calhoun’s outcomes tanked due to a lasting spike in his ground balls. Such a trend continued until his return from the disabled list several weeks ago, which coincided with a sharp decrease in ground-ball production (and, not coincidentally, a sharp increase in overall production). And the reason I say not coincidentally? Kole Calhoun made a gargantuan adjustment. While Calhoun does single through the right side in this play, I’ve selected this clip because it is symptomatic of his lingering tendencies in 2018. While he is facing Gerrit Cole, a most excellent pitcher, Calhoun’s swing path takes the ball straight into the ground. Yes, it sneaks through for a run-scoring knock, but he is completely at the mercy of the defense and fielder positioning. In addition, his hands are tucked behind his shoulder at the time of his swing, which becomes a problem when his timing is out of whack. His hips have opened up here, which elongates his bat path, leaving him unable to transfer his weight and create the lift necessary to hit the ball over infielders’ heads. This is a product of having the toe-tap of his front leg open up too soon, thus neutralizing his power. That is no longer a problem after he came off the DL on June 18, however. While the herky-jerky hands pre-swing might not be ideal and while both those hands are still directly behind his shoulder before he sets himself into motion, Calhoun makes it work for him by hunching over the plate with a higher leg kick parallel to his back foot. This allows him to unlock his power and simultaneously maintain his timing. The leg kick helps him to drive the ball in the air, even though this particular cutter from Kenley Jansen is already at the tippy-top part of the zone. The results have shown that. He’s still hitting the ball hard, but now those balls are finding holes. It is much easier to find empty outfield grass than infield dirt, after all. Before I go, I’ll leave you with one last thing. Intuitively, this makes sense for the type of hitter Calhoun is, 20 home-run/25 doubles pull hitter with above-average speed. A higher launch angle raises grounders to become line drives and fly balls. Surely Calhoun won’t be able to sustain such a high launch angle as pitchers adapt to his new approach, but any marginal improvement is an improvement, and if he continues to adapt at the plate, he would provide additional lineup thump, surplus value, and necessary stability for a club that continues to churn through high-variance players in a search to uncover value. And while defensive metrics require large sample sizes, the red-headed right fielder has added value on defense for the fifth year in a row out of five full seasons; both his DRS and UZR are similarly positive, and his UZR/150 places him third behind Mookie Betts and Aaron Judge. If the Angels are to return to contention in the year(s) to come, one of their most consistent performers will have to step up. Luckily for the club, it appears that Kole is no longer cold. We hoped you liked reading Kole Calhoun Is Cold No More by Rahul Setty! Good article, and thankful that you avoided the dreaded Kold Calhoun moniker I have seen floating around. I wish I had the audacity to say that I didn’t consider it!